It was almost twenty years ago, through a game-book called 'Shadowrun', that I first heard of what is called the 2012 phenomenon. In the next two years you will probably hear a great deal about this event as the date counts down; around the December 21 solstice of that year, it is claimed by some, that the world will be confronted by an apocalypse in the form of various natural disasters. For a number of years, I found discussion about the meaning of the date to be an amusing diversion; it was certainly quite a conversation starter to assert the end of the world with some pretend certainty. But in more recent years the claim has become a little bit stale, as the clamour of sincere claims and fears begins to drown out the enjoyment received from idle speculation about the date. Last month a Columbia pictures film entitled 2012, with a production budget of between $200 million and directed by Roland Emmerich, has been released and has grossed approximately $600 million so far. Emmerich credits Graham Hancock's "Fingerprints of the Gods" as the inspiration of this sci-fi disaster film where solar flares bombarding the earth with neutrinos are acting as microwaves heats the earth's core to such an extent that it causes massive displacement of the earth's crust, shifting of the continental plates and a volcanic explosion of Yellowstone national park in the United States. The film centers on a group of characters as they narrowly escape form one disaster to another as they attempt to escape to rescue ships in the Himalayas, established by a secret G8 project. Reviews of the film have been critical, often pointing out that even with some significant suspension of disbelief the disasters are quite impossible. To promote the film the studio ran a marketing campaign based on the fictional Institute for Human Continuity, where filmgoers could register for a lottery number to be part of a small population that would be rescued from the global destruction. A NASA representative claimed they had received over a thousand inquiries from people who thought the website was genuine, including some teenagers saying they are contemplating suicide because they don't want to see the world end. In addition to this film there has been, for a number of years, various claims of cataclysmic events which derive from archaeological and astronomical speculation, interpretations of mythology, numerological reconstructions and, in some cases, alleged prophecies from extraterrestrial beings. In some cases the interpretations are positive, suggesting a spiritual, or even physical, transformation among the species. Michael D. Coe who asserted in 1966 that among the Maya "there is a suggestion ... that Armageddon would overtake the degenerate peoples of the world and all creation on the final day of the thirteenth [b'ak'tun]. Thus ... our present universe [would] be annihilated .. when the Great Cycle of the Long Count reaches completion." These claims were taken up by a variety of 'new age' scholars, that term being used very loosely. Frank Waters discusses the date and associates it with Hopi prophecies in his 1975 book "Mexico Mystique: The Coming Sixth Age of Consciousness", also shared in the "The Invisible Landscape" by Terence McKenna. José Argüelles discusses events in the 1987 book "The Mayan Factor: Path Beyond Technology" Daniel Pinchbeck was most influential, linking the date and the Long Count to beliefs about crop circles, alien abduction, and various personal revelations in his 2006 book "2012: The Return of Quetzalcoatl". John Major Jenkins, who has authored works on this subject for over twenty years, claims that the ancient Maya intentionally planned the correspondence with December 21 date with the solstice. Further, Jenkins suggests that the Maya derived their calendar on observations of the Great Rift, a band of dark dust clouds in our galaxy, which the Maya called the Xibalba or "Black Road." But from what evidence we have, the Maya would consider the date to the cause of celebration, the conclusion and renewal of the great cycle, although it is rarely referred to in the archaeological record. There is certainly very little evidence whatsoever that the Maya considered that it would be doomsday event. According to Mayan elder Apolinario Chile Pixtun and Mexican archaeologist Guillermo Bernal the concept of "apocalypse" has nothing to do with Mayan beliefs. Mayan archaeologist Jose Huchm says "If I went to some Mayan-speaking communities and asked people what is going to happen in 2012, they wouldn't have any idea. That the world is going to end? They wouldn't believe you. We have real concerns these days, like rain". Further, there is no substantive evidence that the Maya, living in a largely tropical environment, placed any great importance on solstices or equinoxes, whose seasonal variation is more notable in temperate zones. When some New Age scholars speculate that the possibility of an overdue geomagnetic reversal occurring on the date, scientists respond that not only do such reversals take some five thousand years to complete, the last reversal was almost eight hundred thousand years ago; somewhat before the Mayan civilisation. So what are the origins of the rather wild fears and hopes of the New Age movement? It has to do with some rather detailed calculations in an ancient calender. In addition to a 365-day solar calender and a 584-day Venus cycle, and supplemented by Lunar cycles, the Mesoamerican also used what is called the Long Count calender. It was invented by the Olmecs and most notably used by the Mayans, where a a "great cycle" of 5,125 years is marked from their date of creation, equal to August 11, 3114 BC. The Long Count is used on various monuments throughout Mesoamerica, the oldest dated from 36 BCE found at Chiapa de Corzo. The cycle consists of thirteen b'ak'tuns, periods of 144,000 days each and December 21, 2012 marks the ending of the current b'ak'tun cycle. The calendar itself tallies days in a base-20 and base-18 method and positional notation. In the Mayan mythology we are living in the fourth world. The first three creations that the gods failed. In the Long Count, the previous creation ended at the start of a 14th b'ak'tun. The previous creation ended on a long count of 12.19.19.17.19. Another 12.19.19.17.19 will occur on December 20, 2012, followed by the start of the fourteenth b'ak'tun, 13.0.0.0.0, on December 21, 2012. Notably Maya inscriptions occasionally refer to events that would occur on dates that lie beyond 2012, such as the anniversary of rulers. Calenders are, of course, a fascinating and important technology for any population. Their development in a bronze age world must have come at some difficulty. To be sure, the evaluation of basic solar (e.g., Persian) or even lunar time (e.g., Islamic) is easy enough. The calculation of time based on the tropical year would have required some effort, determining the period of time required for the sun to return to the same position in the cycle of seasons. The application of such knowledge was extremely important for the determination of the most effective periods for planting crops and for a nascent climatology. Lunar calendars are particularly useful in correlating with tidal effects. Others combine both lunar and solar (e.g., Hindu), although these become increasingly complex. Calenders also provided a structured way of organising commemorative events, thus enhancing social integration. The Mayan calendar for example was fundamental for ritual life, with 260-day cycles (based on the human gestation period and used ritually as a guide to life) and the succession of the 365-day years, with the individual years allocated as 'Year Bearers', a divinity in its own right. Like the Year Bearers, the thirteen twenty-year periods (katuns) were viewed as divine lords and worshiped accordingly. The development of the calender was an act of brilliance of our ascendants, both in the difficulty of developing such a system in the first instance and in the utility of its application. Like any other technology, most calenders contained errors due to the imperfect observation or calculation of earth's position in the cosmos. The one which we are most familiar with is the Julian and Gregorian reforms. In the former case, the previous Roman calender consisted of 12 months, for a total of 355 days. This was somewhat inaccurate so an additional intercalary month was inserted between February and March to ensure the calender remained roughly aligned to the tropical year. In the latter case, it was realised the Julian calender was inaccurate by approximately 11 minutes per year. So under Pope Gregory XIII the leap rule was altered so century years, which are divisible by four, would not be leap years unless they are also divisible by 400. Again, even this is not perfect, but at least the calender will now take a few thousand years to accumulate an extra day, rather than one hundred and thirty. As a technology, the Mesoamerican calenders had some impressive features, with attention paid to the solar, lunar, Venusian and the gestation cycle. A calendar round dates is composed by interlacing the dates of the 260-day gestation period calender with the 365-day solar period. Place notation in the Long Count an elegant system existed where events could be recorded in linear relationship with each other, and readily expendable. But that is about the extent of it. It was a complex calender was some clever features, but is also contained a number of inaccuracies and it certainly has little predictive value. The attempt of the New Age movement to engage in a commodification and cultural appropriation of Mayan time-keeping is an indication of how little respect they have for ancient and existing Mayan culture, their refusal to engage in rigorous archaeological and anthropological assessment, and their own cultural and spiritual impoverishment. Whilst the title of this presentation includes the phrase "modern nonsense" it may be even more appropriate to refer to a spiritual "modern emptiness", or a cultural imperialism of "modern contemptuousness". It is little wonder that native Americans descendants refer to such individuals as "plastic shaman", fraudulent spiritual advisors, psychics, diviners and soothsayers, of which individuals like Carlos Castenada were but the beginning of a whole cult of liars and thieves. In this sense, even the movie 2012 is far superior to the volumes of artificial studies into the Mesoamerican calender, for at least the film is explicitly fiction. By way of conclusion it would seem that every generation has its share of shysters who, with above average intelligence but limited moral development, seek to defraud more honest but naive individuals. Some do this for personal gain, such as money or more visceral favours, others for status within an organisation and others still for an allegedly higher cause; their religion, their nation, their 'race', their Party, their ideology etc. The popularity of these demagogues is partially do to the fact that people find it easier to accept a simple lie rather than a complex truth and partially due to an irrational want to believe. The so-called Bosnian pyramids are a case in point; a natural formation that was presented as ancient temple-pyramids of a by-gone age with damaging excavations. However more people attended and paid to see these pyramids than genuine archaeological sites within that country. For those of us who oppose such exploitation - which I hope includes almost everyone present today - a few ideas can be suggested. Firstly, clearly distinguish between fact and fiction. Fiction is, of course, highly enjoyable, providing great dramatic narrative and has a strong structural correlation with thinking of people at a time. But reality is often more prosaic. We must have the honour and humility to distinguish strongly between the two. Secondly, for those who are interested in such things, to promote scholarly and rigorous investigation. The Mesoamerican Long Count calender is fascinating. The Mayan civilisation is worthy of study. But genuine knowledge on such subjects are not to be found in fanciful speculations masquerading as wisdom. Finally, it is important that those knowledgeable speak out against such false claims, for to let them lie provides a cover of legitimacy. 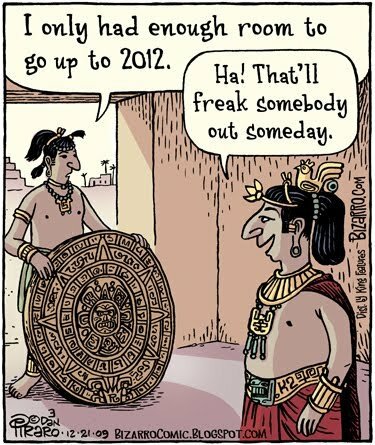 The world is probably not going to end on December 21, 2012 and if it does it has nothing to do with the Mesoamerican Long Count calender. There is probably not going to be a spiritual transformation of the species, let along a DNA evolution, and if there is, that also has nothing to do with the calender. The day will come, it will be like any other, and our struggles and interests will remain the same.